Mondays & Wednesdays in October! Plus Bonus 2x and 5x Multiplier, October 31st! Earn 4x and 2x points on Mondays and Wednesdays in October. 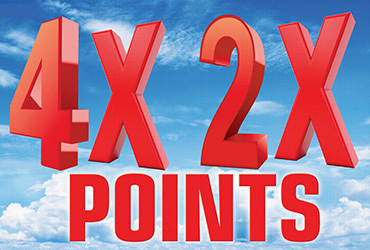 Join us for 4x Points on Reels and Video Reels and 2x Points on Video Poker. Plus, enjoy a bonus multiplier day, Monday October 31 where you can earn 5x Points on Reels and Video Reels and 2x Points on Video Poker.